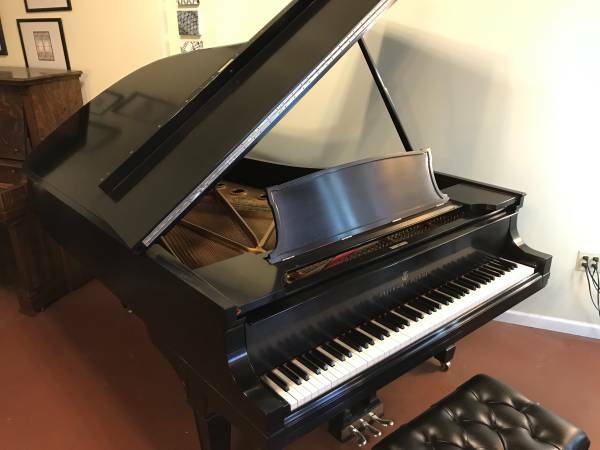 Steinway, Model B, 1924, SOLD! This piano was refinished in the 1980s, and also restrung. The hammers are newer, and have many years of life. This piano is ready to play! It has a big, warm sound with clarity in the treble and the expected power in the bass. It is definitely not over-bright sounding, but rather mellifluous. It came from a private home, where it had lived for many years, and was well-maintained, and not over-played. The cabinet is beautiful, with the styling from the 20's. Chrome accents set it apart, and the original chrome is in great shape. Comes with correct adjustable bench. The pin block is in good condition, and it holds its tune very well. This piano was built in the years when Steinway was making its reputation. A really well-built piano! A new Steinway B costs close to $100,000. If you want a worthy investment, and an instrument that will hold its value, this will prove to be a real bargain.